Update: Being told that they are going to move next week so this post is going to be outdated. For some reason, the name cards are inconsistent. 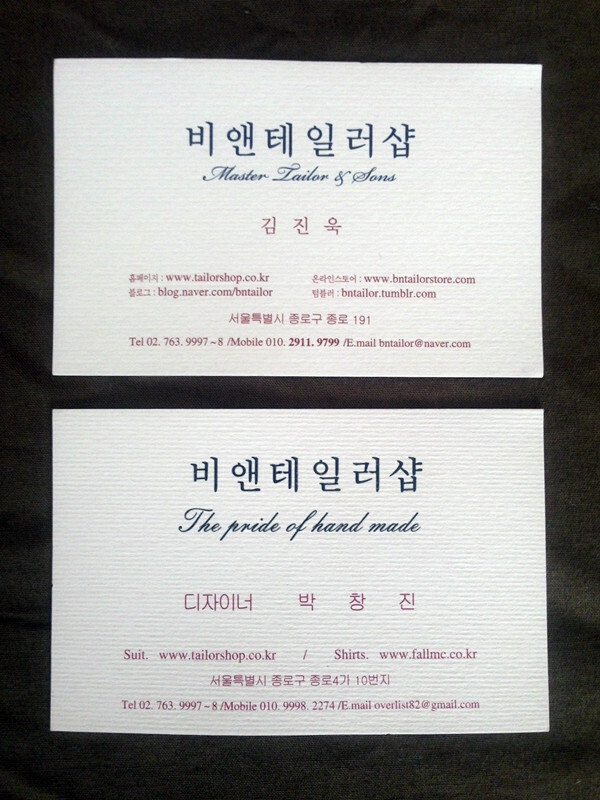 Anyone figured out who this Korean tailor is? There is also a great, great deal of excellence in Taiwan, which I saw with my own eyes. Easily beats all the Savile Row & Napoli stuff. At surprisingly moderate prices. Absolutely. Nutcracker has such a great thread over at SF on Japanese bespoke shoemakers (and another much lesser one on Taiwanese shoe shops) that I wonder if he has been keeping tailoring gems in his native home to himself. 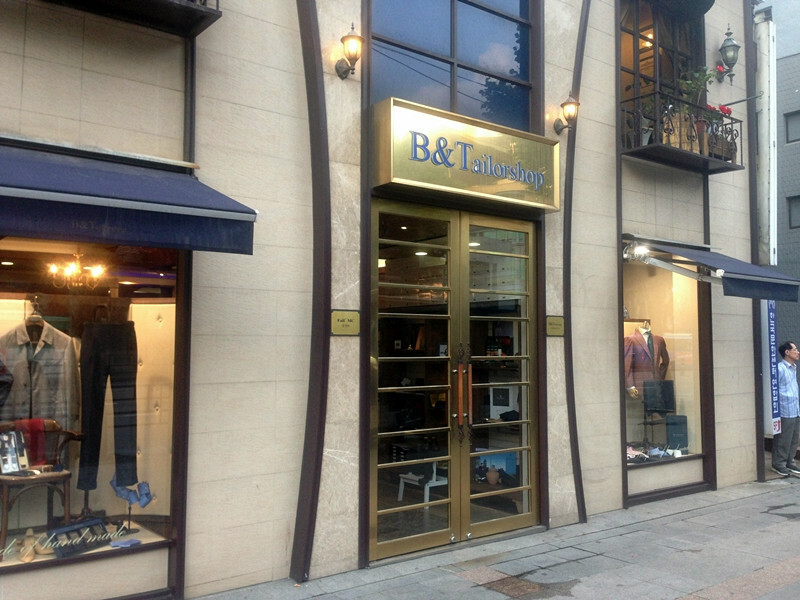 2 Taiwanese tailoring shops being bandied around on English-speaking forums are Tom Tailor http://www.tomtailor.com.tw/ https://www.facebook.com/tomtailor1916 (politician-patronizing so here's a warning sign) and Nobility Tailor http://www.nobility.com.tw/. Prices in Taiwan may not be as low as one might be expecting so I can see why Hong Kong and Shanghai tailors may present more value. The Taiwanese do have a knack for winning tailoring awards. Jeremy should know this one. 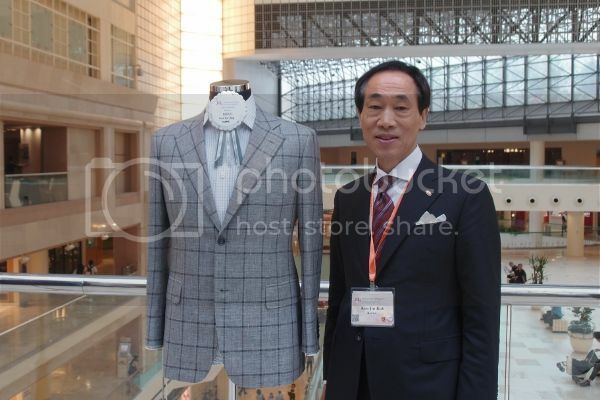 there is this Phoebus Yu https://www.flickr.com/photos/66015253@N00/ who posted his 力上 suit in comparison with a Gieves & Hawkes https://www.ptt.cc/bbs/Suit_Style/M.1383407294.A.C00.html. I don't know their price level, but I can't imagine Lih Shang would cost all that much. I was in the hotel room of the head cutter, and he had taken off and laid down his jacket on his bed. So I took a look at it. It has a rational, abbreviated construction. It isn't an overwrought profusely handsewn showpiece like the Neapolitans would make. A functional, affordable, everyday jacket, that's how it struck me. Nothing baroque. Even plain. Their emphasis is on the cut, not the handsewing. Their styling is English -- no Neapolitan influence yet (phew!). As an indication of price, Phoebus Yu paid 39800 TWD for the above said suit which is equivalent to 1330 USD. Fabric used is John Cooper 150s with cashmere. John Cooper appears to be made in England and belongs the same group that owns Holland and Sherry. What Lih Shang lacks, I think, is marketing and an active sophisticated fan base. The pictures from Phoebus Yu lack polish and his choice of certain stylistic details is highly debatable. Lih Shang's Facebook page takes too many pictures off the web and does not showcase their own suits. International customers will be put off or at least more than a little hesitant. In contrast, Gordon Yao http://www.gordonyao.com/en_index.asp is about 1500 USD and Lee Baron (Peter Lee) http://www.leebaron.ca/ is about 1200 USD for VBC. Both of which are more well-known on the internet and are well-reviewed. Ok I better stop now. USD 1330 is very moderate. There are tailors who charge this much for a fused Super 150's in KL. 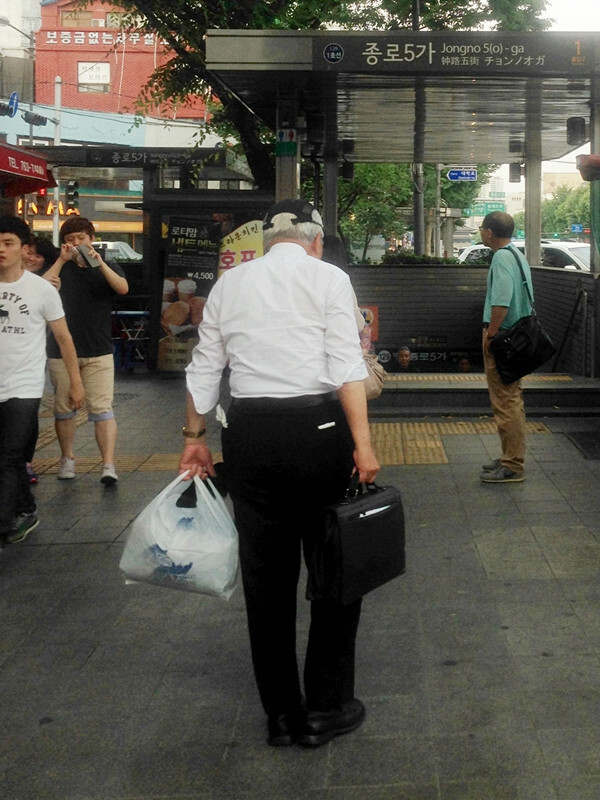 Did you ever find out the identity of the Korean tailor in your pic yet? I think residentdandy or Gerard might have a clue. 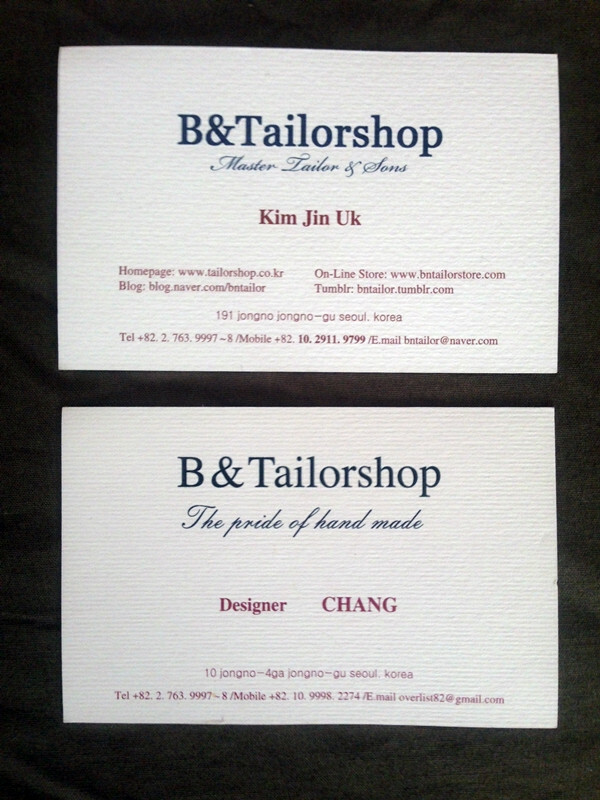 B&Tailor is coming to Singapore on 9-10th December. info@leongt.com. Must be doing a nice bit of business from Singaporean customers. #menswear hashtag is way too effective. They have their own tailoring. I wonder what is the purpose of a tailor doing so many trunk shows featuring other tailors !!! For their price point, what do customer think of their stuff being "outsourced" ? Especially when most of these tailors emphasize their work as piece of art...maybe a new era of industrialistion of bespoke wear ? I don't know how these tailors who travel so much deal with the post-trunk workload. Do they really just hand off all the complexities of the commissions to a "team" who executes them, pretty much autonomously, and to a very high standard of quality and specification-conformity, while the fitter deals with appointment schedules, the regional retail partners, and the travel? If so, these people are part of extremely well-managed organizations. Their true art is in building such organizations, while being absent most of the time. Anybody with general management responsibilities know that organizations are like old cars. You wake up every morning, and you wonder what became broken while you slept and what will break in the course of the day.